Love, death, Bruce Willis, public urination, being a woman, love, The Nanny, love. 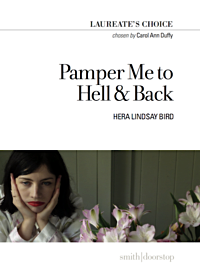 This pamphlet of poetry by Hera Lindsay Bird is a startling departure from her bestselling debut Hera Lindsay Bird by defying convention and remaining exactly the same, only worse. This collection, which focuses on love, childish behaviours, 90’s celebrity references and being a woman, is sure to confirm all your worst suspicions and prejudices. Hera Lindsay Bird was born in Thames, NZ, in 1987 and lives in Wellington. Her debut book of verse, blithely titled Hera Lindsay Bird, was published in 2016 to immediate and vast acclaim, and won best first book of poetry at the 2017 Ockham New Zealand Book Awards.